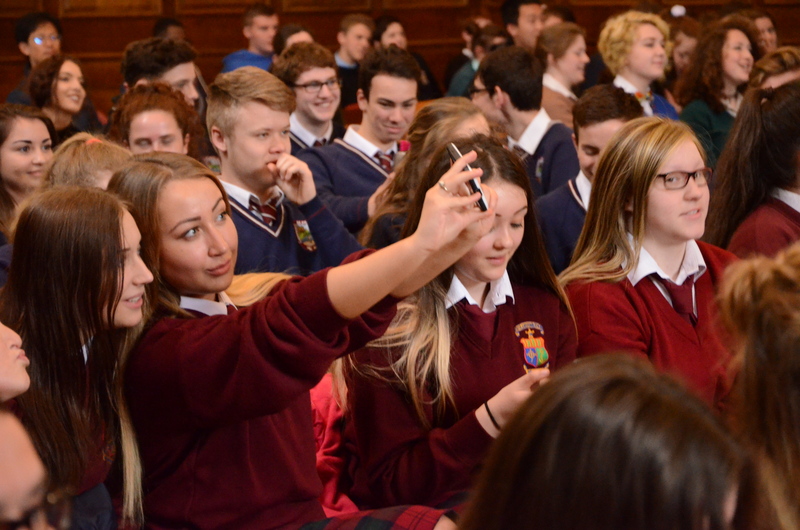 Mercy Inchicore students at graduation. 300 students participated in the Bridge21 TY graduation ceremony on Tuesday 5th May in the Old Dining Hall in Trinity College. 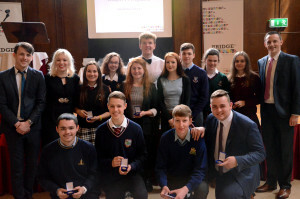 Along with teachers, parents and representatives from TCD, they came together to recognise and celebrate their great work and achievements at Bridge21 throughout the past year. Our keynote speaker was Sean Coughlan, CEO of Boards.ie and founder of Social Entrepreneurs Ireland. Sean spoke about the importance of failure. He shared two personal examples to illustrate his point. One was his Masters research in Physics, which he started and never quite finished, and another was his first business venture, importing sultanas from Turkey. He didn’t make any money but he learned a lot and that “failure” set him on the road to future successes. He quoted Samuel Beckett’s famous line, “Ever tried. Ever failed. No matter. Try Again. Fail again. Fail better.” and told the students to work hard to avoid failure, but never to fear it. Sean Coughlan addresses the students in the dining hall. Dr Joseph Roche kindly agreed to present the students with their certificates on the day. Dr Roche is Course Director of the Level 9 Certificate in 21C Teaching and Learning here in Trinity College Dublin. Part of that role is to allow teachers to experience what the graduating students experienced in Bridge21 with a view to introducing the same ideas into their own classroom practice. 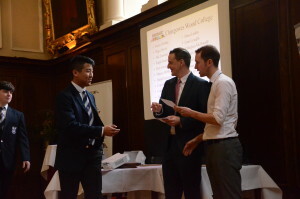 Dr Joseph Roche presents Gavin Cheung with his cert. Apart from the special guests, the real stars of the show were the graduating students and, to emphasise this, there was an award ceremony to honour some of the outstanding students and teams who had participated in the programme. 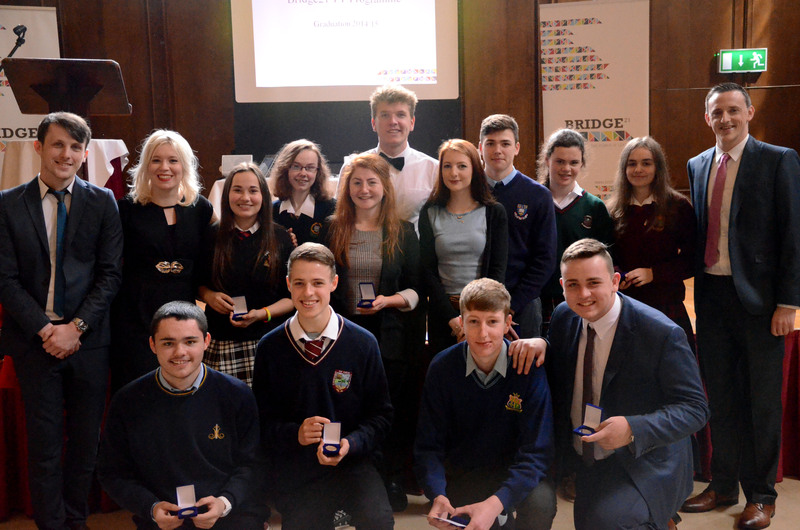 The “Spirit of Bridge21” winners were Michaela Courtney from Colaiste Bride and Philip Manifold from Drimnagh Castle CBS. The Language Student of the Year was Aaron Connolly from St Joseph’s in Rush. The GOAL award for Development Education went to Emirjeta Doda from Westland Row CBS and Mount Temple Comprehensive picked up two medals as The 21C Media award went to Eva Evans Foley and the Learning Circles award winner was Niamh Cuddy. The Bridge21 team with our award winners. The “Computer Science Team of the Year” award went to The Muggles. 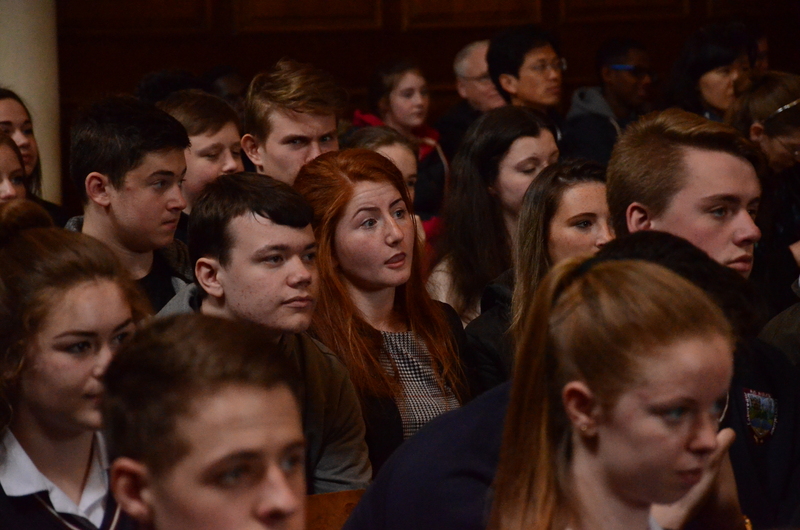 The Muggles are Raluca Magadan from Mercy Secondary School in Inchicore, Jack O’Donohue from St Michael’s College, Ivan Fitzpatrick from St Mary’s Diocesan, Drogheda and Victoria Byrne from St Leo’s College, Carlow. Finally, Big El Hombres won the overall “Team of the Year” award. Big El Hombres included David Dorman and Ryan L’estrange from Drimnagh Castle CBS, Adam Herd from Moyle Park College and Darragh Maguire from Donabate Community College. 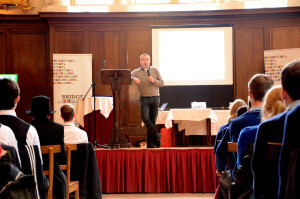 The graduation marked the end of the Bridge21 TY programme for another year. It’s been an exciting year for Bridge21 TY programme team. We’ve worked with more than students than ever before. We’ve worked with students from broader mix of schools than before. We’ve had the chance to use “Bridge22“, the new learning space here in Oriel House and we’ve developed many new activities and student workshops. It’s been a huge amount of fun and it would not have been possible without the help and cooperation of so many teachers and our amazing volunteer team. 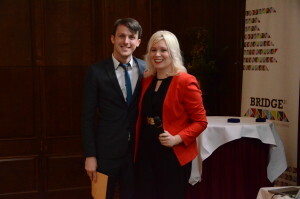 Grace Lawlor joined the Bridge21 team this year and has made a huge contribution to the student programme and Grace presented Daniel Sheridan with a special award to recognise the exceptional commitment he has made to Bridge21 as a volunteer over the last 9 months. While there were some sad goodbyes at the end of the ceremony, we certainly hope we’ll see many of these students again. In fact, some of the students will be back with us during the summer to take part in new workshops, which is a testament to how much they enjoyed their time working and learning with Bridge21. For now though, we’d like to say a final thank you and congratulations to all of the Bridge21 TY graduates and award winners! You can check out some of the highlights of the ceremony here…. This entry was posted on Wednesday, May 13th, 2015 at 9:20 pm. It is filed under Students Blog. You can follow any responses to this entry through the RSS 2.0 feed.